Judson Grenier, who now lives in Manhattan Beach California, sent the History Club the following reminiscence about visiting his aunt and uncle in Madison–Norman Wang (1893-1983) and Dagny Wang (1897 -1988), who owned the Ben Franklin store when it was at 2110 Atwood Ave (where Dobhan Restaurant is today). My uncle Norman Wang owned a compact but quite fancy Chris-Craft motorboat that was housed at a boat yard next to an outlet very near to Olbrich Park (Starkweather Creek). You had to drive the boat under the Atwood Avenue bridge to get into Lake Monona. Norman allowed 10-year-old me in 1940 to streer to the Yahara River, up which we sailed into Lake Mendota to go fishing. His favorite spots were along the far shore. I don’t recall catching much other than perch and bass. During the time I visited the Wangs they moved a number of times. In 1940 they lived in a single home at 506 Russell Street, within walking distance of the store. Another of my visits occured after they moved to a duplex at 1225 Rutledge early during World War II. The duplex had a view of the lake. They drove to the store from the duplex, but I could walk. I spent some time in the air-conditioned Eastwood movie theatre nearby, and sometimes they would let me run one of the store’s cash registers. In the summer of 1946 I hitch-hiked with a high school friend, John Munson, from St.Paul to Madison. We were 16, but about to enter our senior year in high school. Aunt Dagny found ways to entertain us, and she was something of a match-maker. 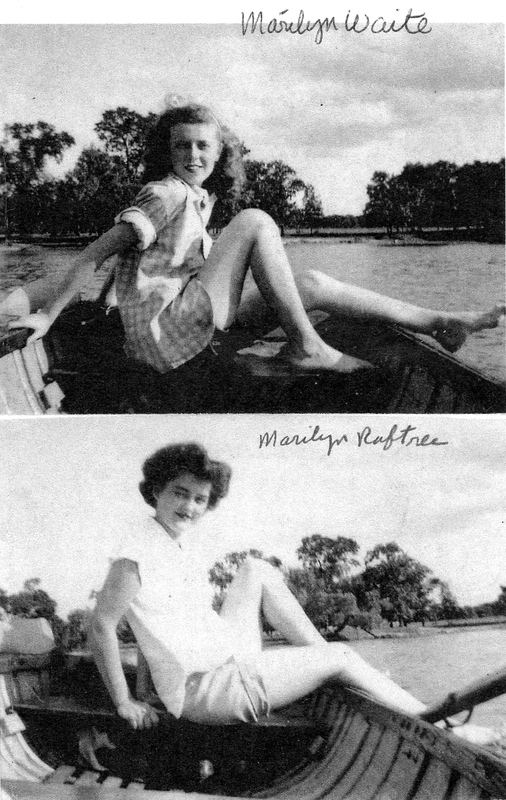 She had a number of girls our age who worked in the store part-time, and she arranged for us to have both daytime and nightime dates with two of them, Marilyn Waite and Marilyn Raftree. She thought that we would fit well together, and she was right. Madison had a teen canteen started during the war that was still functioning in the north part of downtown to which we took the bus (The LOFT), but my memories are of walking the streets around the high school and occasionally stealing a few very tart green apples from local trees. The girls arranged for us to sign up to join a harvesting crew out in farm country to earn some cash, as apparently many Madison teenagers did in the summer, but it proved to be tough, dirty work and both my friend and I were allergy-choked from following the harvester thru the fields all day. We lasted one daily only–and never saw the money for that day’s work. Many years later, after six years in college, three in the army, a new profession, wife Nancy and four kids, the whole family and dog in an overcrowded Travelall SUV visited the Wangs in their innovative all-aluminum (Lustron) home at 5112 Tonyawatha Trail in Monona. They had achieved their dream of owning a home that they had helped to design, and still were near enough to the store on Atwood to commute reasonably easily along the Monona backroads. A highlight for my kids was to walk across the street from that modern home in their bathing suits and swim in Lake Monona while the sun went down and the Capitol across the lake was highlighted by the sunset. Apologies for the incorrect date printed on our mailed invitation this month! We meet on Saturday, April 21, at the Goodman Community Center, 2pm. 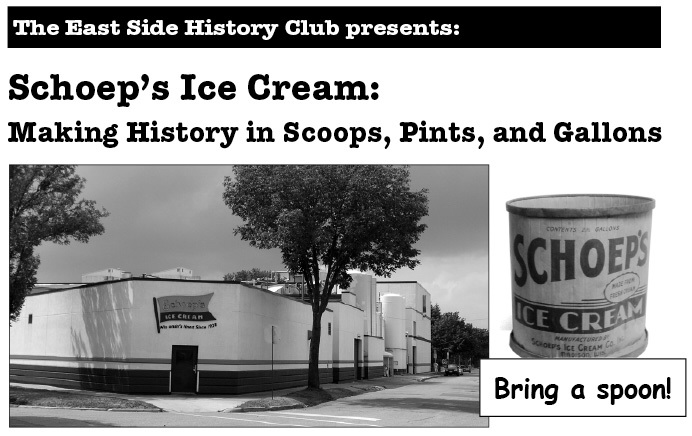 John Thomsen (one of the third generation of owners) speaks on the history of Schoeps Ice Cream, from its humble beginning in the back room of a grocery store to a company serving 49 of the 50 states.